Caregiving is an ever-changing journey that can raise more questions than answers when it comes to caring for your loved one, because as a caregiver, we always want what’s best for the people we love. 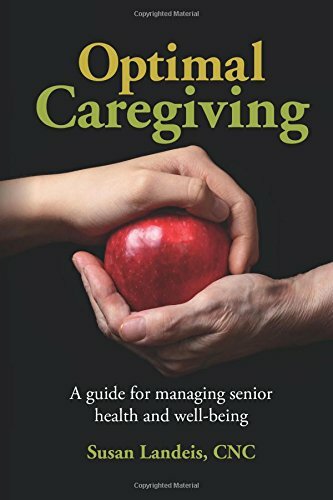 Optimal Caregiving: A Guide for Managing Senior Health and Well-Being shares awareness of good nutrition, healthy lifestyle, and emphasizes the importance of self-care for the caregiver. As a certified nutritional consultant, Susan Landeis, understands that each person is an individual with a unique set of circumstances. She is not a proponent of offering a one-size-fits-all strategy for senior health, but believes that providing useful information will empower and guide you on your quest for better care. Some of the practical guides you will find within this book relate to the changing nutritional needs of seniors and age related issues. This book will also help you learn about healthier ways to prepare meals, tips for home safety, helpful resources, and answers to some common questions. Optimal Caregiving will help take the guesswork out of healthy aging, while helping you provide a healthier lifestyle for your senior loved one and yourself!